Pickens County, SC is located in the upstate piedmont region, near Greenville. The highest point in the state is in Pickens County – Sassafras Mountain. It is also home to Table Rock State Park. With a history steeped in agriculture, the area has many bluegrass and country music traditions which students in the YAM programs are learning to carry on. There are several annual festivals celebrating Southern Appalachian Music. 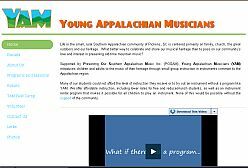 Ambler Elementary School is part of the Pickens County, SC YAM (Young Appalachian Musicians) initiative, supported by P.O.S.A.M, Inc (Preserving Our Southern Appalachian Music, Inc.), Pickens County Schools, Pickens Recreation Department, Pickens Senior Citizens’ Center and the Hagood Mill Historial Society. Ambler Elementary YAM is for students grades 3-5 at Ambler. The program offers fiddle, band, mandolin, guitar and banjo. Ambler YAM meets on Tuesday, Wednesday and Friday with string band on Tuesday for the more advanced students.